Indian banking sector is vast and is one of the influential industry in the country's economy. The banks play a vital role in keeping public's savings safe and provide the interest. The account holders also can avail several other facilities at the bank. Before Independence of the country, several banks got established. After Independence, several major reforms introduced, and since then Indians are witnessing several changes. There are numbers of banks in both public and private sector. The Government manages and runs the banks in the public sector while individuals run the banks in the private sector. But, not all the banks in the public sector were in the public sector. The government nationalised twenty banks and made them public from private. 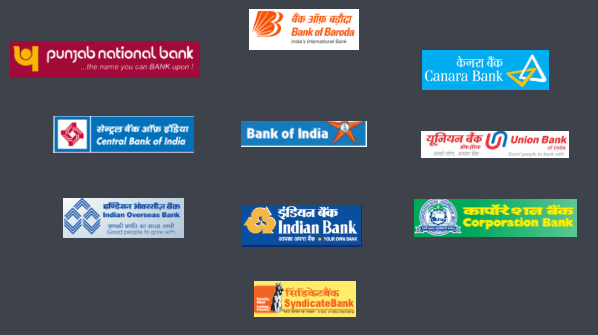 On this page, you will get the list of top 10 nationalised banks in India in 2018. Punjab National Bank is one of the most popular banks in India that established in 1895. PNB presently has 7200 branches and 9700 ATMs across the country. It serves across 10 million customers every year. PNB got nationalized in 1969. Bank of Baroda is widely spread across the country and gets distinguished for having highest numbers of International branches. It has around 8100 ATMs. Bank of Baroda has set a benchmark in the industry for delivering prompt services with fast responses ensuring better customer satisfaction. Bank of Baroda got nationalized in 1969. Canara Bank presently has 5600 branches across the country in different cities and also has branches across eight other countries. Within recent time, Canara Bank emerged as one of the leading banks serving around 90 million customers. It got established in 1906. For excellent customer services, the bank received several awards. Canara Bank got nationalized in 1969. Central Bank of India established in 1911 and is one of the oldest banks in the Indian banking sector. The bank has 4300 branches across 26 states. It has set up around 9153 ATMs. Central Bank of India is determined to deliver high-quality banking services to its customers across the country. The bank got nationalized in 1969 and is the 4th best-nationalized bank. Bank of India got established in 1906. The bank has 4980 branches and 55 zonal offices across the country. Apart from India, Bank of India has marked its presence in 22 countries. This commercial bank improved its services in recent times and emerged as one of the best-nationalized banks. Bank of India got nationalized in 1969. Union Bank of India established in 1919. It gets considered as one of the finest banks for delivering high-quality services to its customers. The bank has around 4000 branches across the country. Presently, it has more than five million satisfied customers. The bank got nationalized in 1969. Indian Overseas Bank got established in 1937 by Mr. Chidambaram Chettiar. The ultimate aim of the bank was to encourage overseas banking and attract foreign investments. This bank is ISO certified and has around 3700 branches across the country. It has branches in Bangkok, South Korea, Hong Kong, etc. it got nationalised in 1969. Indian Bank got established in 1907 and currently, it offers excellent and advanced banking services. It has around 2600 branches and 160 ATMs across the country. Indian Bank scaled up its reputation in recent times. Indian bank got nationalised in 1969. Corporation Bank got established in 1906 and got nationalised in 1980. Currently, the bank has 3100 branches along with 3200 ATMs across different cities in the country. It is one of the oldest banks is respected in the industry for its continuous growth of customer base and advanced banking services. Syndicate Bank established in 1925 and is one among the old commercial banks in Indian banking sector. This bank is growing fast with its excellent banking services. It has more than 3500 branches and 500 ATMs across the country. Indian government nationalized Syndicate Bank in 1969. It is one of the leading commercial banks in India.